Yes! This is sort of a celebratory strip because tomorrow – December 1st – www.optipess.com has been online for 1, one, year! A blog post about this momentous occasion should be imminent, but for now check out the Optipess retrospective from a few weeks ago when I hit 100 comics. Oh, and I hope you like that new comic up there. And thanks for reading! congrats on making a year, and well done! Awesome strip! I’m glad you’re drawing more zombies! I’ve been zombie obsessed lately, between Haiku Comics and Plants vs. Zombies, so this fills my necrocomedy needs quite nicely. Poor bat and flies though! And… fleas? @Yacine: Zombies are terrific fun to draw. :) I noticed with zombies that my linework doesn’t have to be as clean as I usually aspire to, as a more uneven look actually is an improvement. Oh, and I can reveal that Haiku Comics definitely was the inspiration for this strip. @Luke: Huge thanks! And yeah, by digging/stumbling/etc the strip will be spread to more people, so clickyclicky, people! Wow, the ultimate horror-gag. An congratulatore on your 1 year anniversary! Happy Anniversary and you are awesome. Have I mentioned that you’re awesome? Aw, thanks. :) I’m actually blushing and looking at my feet as I type this. Aw, yeah that’s pretty similar. I’m not really into Cyanide & Happiness so I hadn’t seen that one before. But cool to see that it was a guest comic by Ryan Estrada! 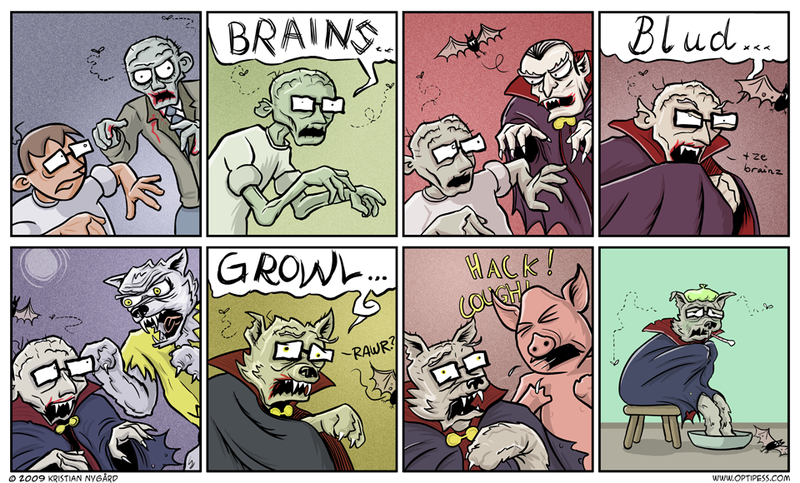 It’s a werezompire with swine flu indeed. Laughed so hard. Damn. IDK why, too funny.